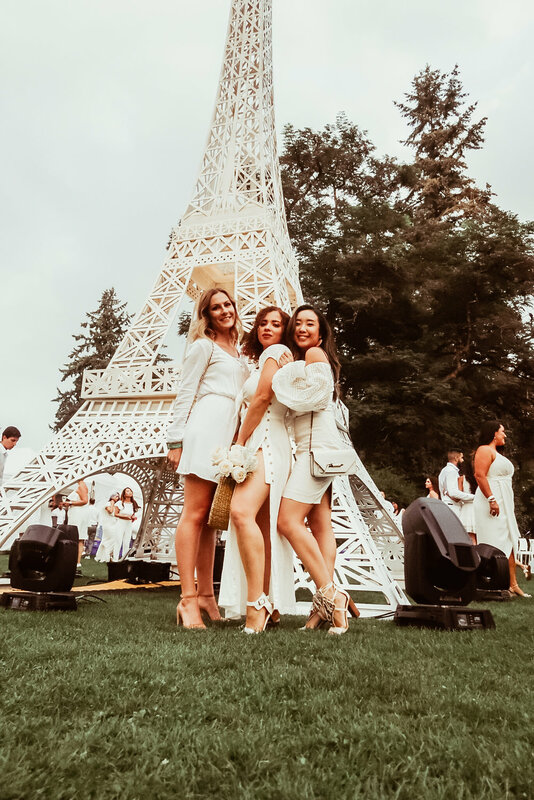 I had the pleasure of attending my 4th Diner en Blanc - Vancouver last week and it never seems to amaze me how they continue to outdo themselves every year! This year was a beautiful Parisian theme celebrating their 7th anniversary in #Vancouver. With the perfect location held at the stunning Vandusen Botanical Gardens, delicious catering from @hawksworthrest @hawksworthcom, music from the @vsorchestra, and @jpchenetcanada Ice Sparkling Wine (which I have to admit might be my new favourite)... I couldn’t have attended a more memorable evening. I want to personally thank @tsc_agency and @camber_comm for having me, as I am excited to see how they top everything next year! This year, I cut it pretty close and pre-ordered my Dress from: Free People about two weeks in advance. Although, I paid extra for express postage it was delayed and arrived literally on the day of Diner en Blanc...Talk about a Crisis Averted! One thing I can definitely vouch for is that finding an all white outfit, that no one else is wearing is probably the hardest part about attending this event. I like to start looking at the beginning of the month and really zone in on the "look" i'll be trying to achieve for the night (I promise you become more and more prepared every year). This year, I was lucky to be a guest in the media lounge and did not have to bring any items to setup for dinner. If you are attending with a table and need to bring your own items, I recommend that you purchase an all white table set from Ikea as they are extremely affordable and then add your own decorative flare using your centrepiece and table settings. As for food and drinks, I recommend purchasing from Diner en Blanc's website beforehand as its one less thing to worry about bringing and they never seem to disappoint! Now, get ready for one magical evening. Have you ever been to #Dinerenblanc? If so, would love to hear all about your experience. Haven't been yet? Let me know any questions you may have about attending the next one and i'll be happy to answer.